In some ways, this tale of the exploitation of unpaid interns working in a theatre could be considered a timely revival looking at the ethics of the industry. 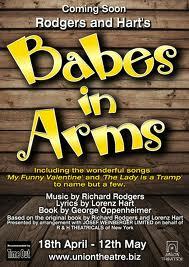 But though that is the pretext of Babes in Arms, it is a much more whimsical piece than that – a 1937 Broadway musical from Rodgers and Hart, frothily light in plot but musically superlative in places, brimming with standards like ‘The Lady is a Tramp’, ‘Johnny One Note’ and ‘My Funny Valentine’. This production uses a revised book from 1959 by George Oppenheimer in which a team of bright young apprentices toil away at a struggling theatre, falling in and out of love with each other at the drop of a hat and secretly rehearsing a musical revue which they hope to put on. It’s undoubtedly a candy-floss ball of a plot but cheerfully and entertainingly staged in David Ball’s production with Sam Cable’s sharp 3-man band and splendidly enlivened by the interjections of Lizzi Gee’s suitcase-wielding and delightfully tap-heavy choreography. A largely young and fresh-faced cast cleaning up ‘backstage’ as we enter the auditorium, the percussive noises from their chores leading neatly into the first rendition of the tuneful ‘Babes in Arms’ and out of the ensemble, appealing performances do emerge. Catriona Mackenzie makes a kicky heroine out of Susie who only has eyes for James Lacey’s Valentine (as in My Funny…), who in turn is mooning over visiting actress Jennifer, Carly Thoms in sweet form. But the eye is really caught by Ben Redfern’s charismatic Gus, well partnered by Anna McGarahan’s buxom Terry in the delightful I Wish I Were In Love Again and by Jenny Perry’s Bunny, the put-upon co-owner who blossoms under the spotlight and delivers some of the best songs with the straight-forward earnestness that shows like this need to in order to succeed. That earnestness isn’t always present across the board though, which means that there are moments when the energy flags a little and the feeling of fun not quite there. And the second half does see the show making some perplexing decisions: the central romance that seems to have been building gets dropped like a hot potato; the focus in the finale seems oddly placed on Bunny. But if one leaves such quibbles aside, there’s much charming, uncomplicated fun to enjoy here, not least in the brilliantly played take-off of a stereotypically bad Southern melodrama.